Conservation: Clouded copper, subspecies nubila, has greatly declined in the vicinity of Los Angeles, California. 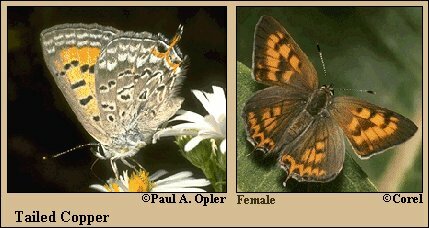 Lycaena arota nubila has The Nature Conservancy rank of T1 - Critically imperiled because of extreme rarity (5 or fewer occurrences, or very few remaining individuals), or because of some factor of its biology making it especially vulnerable to extinction. (Critically endangered throughout its range).